The well construction diagram includes both the fill material used in construction of the well and the essential hardware, such as the casing, screen, surface casing, cap, etc. The hatch patterns used in representation of the fill material are selected from the Fill Style tab. Well construction diagrams may be drawn either to scale (so that the hole and infrastructure radii are of the same relative scale) or in a simpler representation that simply fills the allotted space. 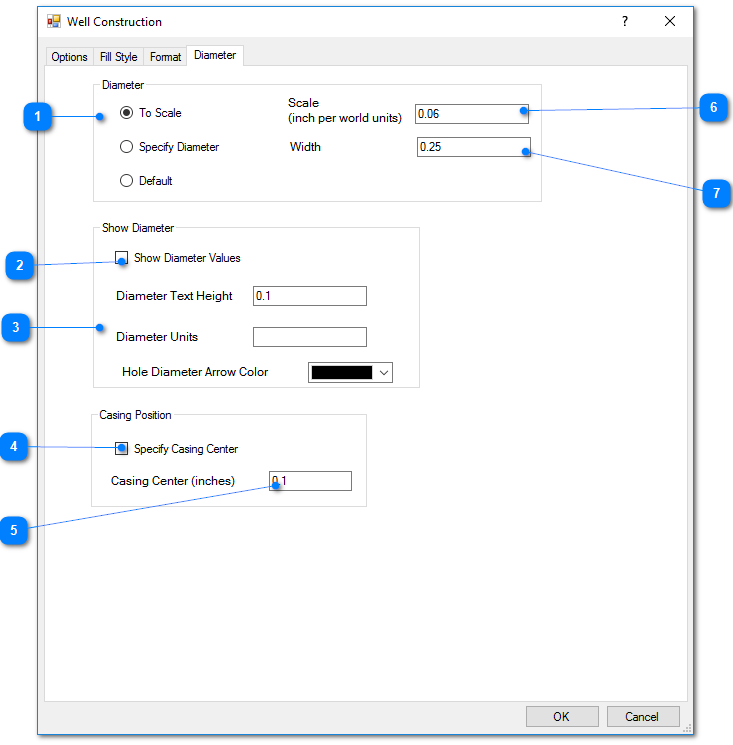 For non-EQuIS database users, nested wells may be displayed by placing a comma-delimited list of location IDs for co-located wells in the Colocated field of the Locations table. 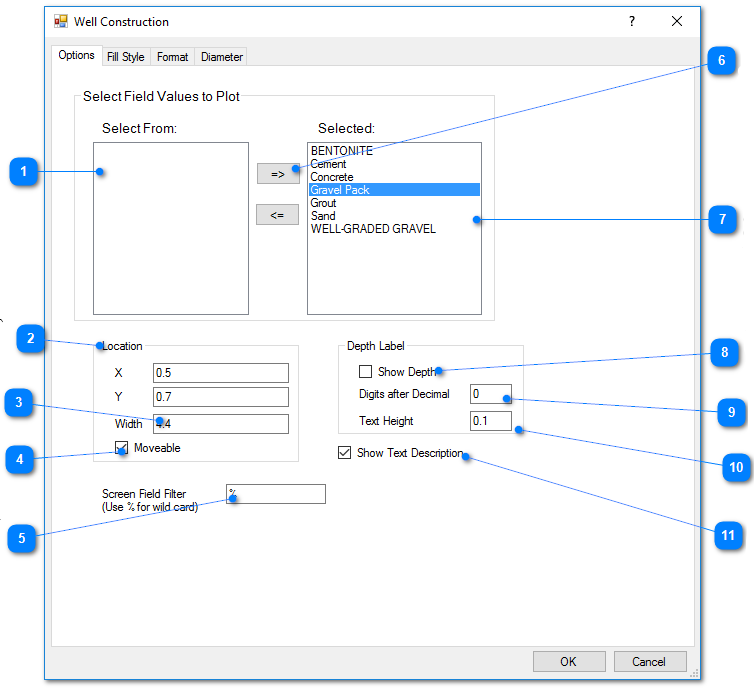 For EQuIS-users, multiple screens or nested wells may be drawn by populating the DT_LOCATION.PARENT_LOC_CODE field for each of the nested wells. Multi-screen wells, where the screens are drawn aligned vertically, are indicated by not including a casing record in DT_WELL_SEGMENT for the locations representing the individual screens. Multiple generations may be used to draw a multi-screen well as the second of multiple nested wells. Double-click on the well construction field to add it to the report. 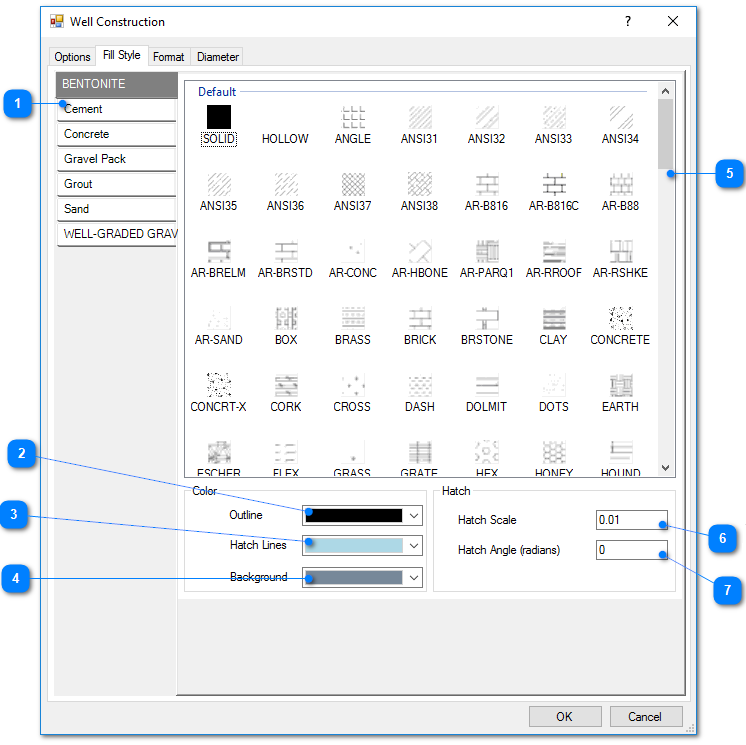 Once in the report, double-click the well construction object to open the Well Construction dialog box. 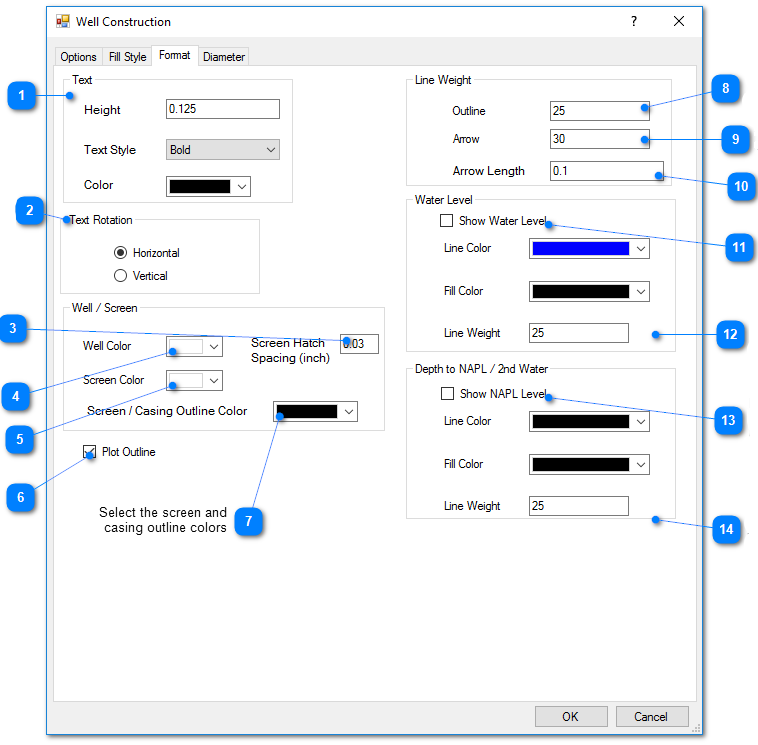 Modify the Options tab, Fill Style tab, Format tab, and Diameter tab as desired. Click the OK button to save changes. Check the Show Text Description box to have descriptions of individual well elements appear on the boring log. Non-EQuIS users should place the text description values in the Notes field. For EQuIS users, the text description is taken from the first non-null value of the following fields: DT_WELL_SEGMENT.REMARK, RT_WELL_SEGMENT_TYPE.MATERIAL_TYPE_DESC, or DT_WELL_SEGMENT.MATERIAL_TYPE_CODE.